» A 1001 MIDNIGHTS review: CARROLL JOHN DALY – The Snarl of the Beast. A 1001 MIDNIGHTS review: CARROLL JOHN DALY – The Snarl of the Beast. CARROLL JOHN DALY – The Snarl of the Beast. Edward J. Clode, 1927. Previously serialized in Black Mask, June-July-Aug-Sept, 1927. 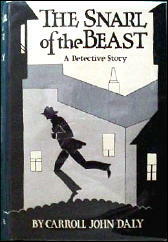 Hardcover reprint: Gregg Press, 1981. Trade paperback reprint: Harper Perennial, 1992. Carroll John Daly was one of the fathers of the modem hard-boiled private eye, a primary influence on such later writers as Mickey Spillane. His style and plots seem dated today, but the presence of his name on the cover of Black Mask in the Twenties and Thirties could be counted on to raise sales of the magazine by fifteen percent. 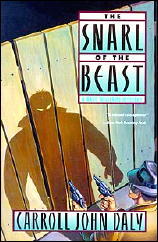 Daly’s major contribution was Race Williams, the narrator of The Snarl of the Beast and the first fully realized tough-guy detective (his first appearance, in the June 1, 1923, issue of Black Mask, preceded the debut of Hammett’s Continental Op by four months). Williams was a thoroughly hard-boiled individual. As he says of one criminal he dispatches, “He got what was coming to him. If ever a lad needed one good killing, he was the boy.” Williams doesn’t hesitate to dole out two-gun, vigilante justice. Williams is willing to take on the job and to give the police credit for ridding the city of this menace, just as long as he gets the reward. Along the way he meets a masked woman prowler, a “girl of the night,” and of course the Beast himself. Daly is not known for literary niceties — his style can best be described as crude but effective — yet there is a certain fascination in his novels and his vigilante/detective. Race Williams also appears in The Hidden Hand (1929) and Murder from the East (1935), among others. Daly created two other series characters, both of them rough-and-tumble types, although not in the same class with Williams: Vee Brown, hero of Murder Won’t Wait (1933) and Emperor of Evil (1937); and Satan Hall, who stars in The Mystery of the Smoking Gun (1936) and Ready to Burn (1951), the latter title having been published only in England. Editorial Comment: For a long expository commentary of the book as well as the author, see Mike Grost’s Classic Mystery and Detection website. Included is a breakdown of the novel into its singular parts as they appeared in Black Mask magazine. I read THE SNARL OF THE BEAST in the BLACK MASK issues. Great title because it had me snarling after reading it. Nice discussion of the novel by Mike Grost at the above link. Let me second Walker’s praise for Mike Grost’s piece on Daly and SNARL OF THE BEAST. Well done job. Thank you very much to everybody for their kind words! Daly is a fascinating writer, at hi sbest. Hope this coverage in Mystery*File will bring him some new readers. Most of Daly’s fiction is still in pulp magazines, never reprinted. It seems likely there are some hidden short stories gems among this huge output. I guess it’s from reading pretty much nothing but pulp for years and years, but I find Daly to be highly enjoyable to read. I’m in the middle of Snarl right now and it’s a real page turner.